LAKEVILLE, IN. 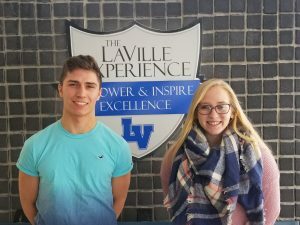 – After nominations from winter head coaches, and an open vote on www.lavilleathletics.com, cheer crew member Charlet Kapke and wrestler Nick Felke have been selected December Athlete of the Month. The LaVille Athletic Department and Lapaz Lions Club sponsor the monthly honor. Kapke won 64% of the vote as compared to 36% for basketball player Kelsey Aschenbrenner. Felke won the male vote by 148 total votes. Felke collected 51%, while basketball player Jared Beehler grabbed 49% of the vote. Kapke said she was never considered a flyer until this year. Each month coaches are asked for nominations. Those nominations go beyond stats. They are also considered because of willingness to be a team player, attitude, and leadership. very honored,” explained Kapke. “There are plenty of other female athletes who are deserving of this award, and for me to be among one of them, it makes me feel as if I am doing something right, and am making a difference in my team. 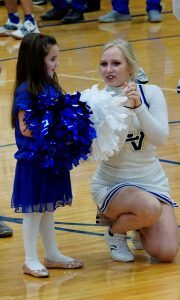 Kapke was willing to step outside her comfort zone and become another flyer to help highlight the specific cheer. Felke, the male recipient, recently won the Hoosier North Athletic Conference title at 132, then finished third at the Indiana High School Athletic Association Plymouth Wrestling Sectional. Felke is also proud to have been selected the male Athlete of the Month. Though Felke has wrestled in a couple other weight classes during the season, he pretty much sticks with 132.